Congratulations to Trigometric Sdn Bhd for being the 1st Malaysia PMG & NGC Authorized Dealer. Trigometric Sdn Bhd or also know as "K.N Boon Shop" founded in 2002 specializes solely in dealing with World Stamps, Coins, and Banknotes. The shop own by Master Sifu KN Boon, one of the known celebrity in Malaysia Numismatic. Their shop located in Amcorp Mall, Petaling Jaya. 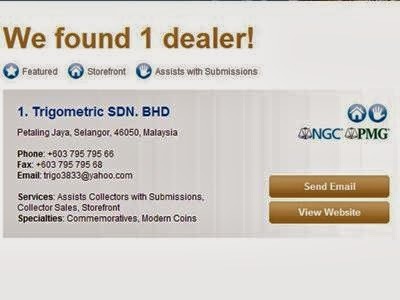 Searching for their information in NGC, I found they're the only Dealer under Malaysia and they're offering Services: Assists Collectors with Submissions, Collector Sales, Storefront and Specialties in Commemoratives & Modern Coins. Under their name I can found Paper Money Guaranty (PMG) and Numismatic Guaranty Corporation (NGC) badge. I know there are many dealers out there that offer third party grading to NGC, PCGS or PMG but all of them will send your item to Singapore. Trigometric Sdn Bhd will send your item directly from Malaysia. Hopefully their price will be cheaper and we will received our graded coins faster. I am still waiting for information about their term & condition and charges for their services. Will share it in this blog later if I already received that information. For further information, you can contact 03-7957 9566 (Mr. Koay / MS Farah).